Can you believe it’s May? Honestly this year is flying by so fast! Here’s a quick recap on what I styled and chowed down on last month! Boston weather has been so wishy-washy this season – one day it’s in the 70’s, the next we’re back to the 40’s and it’s raining! 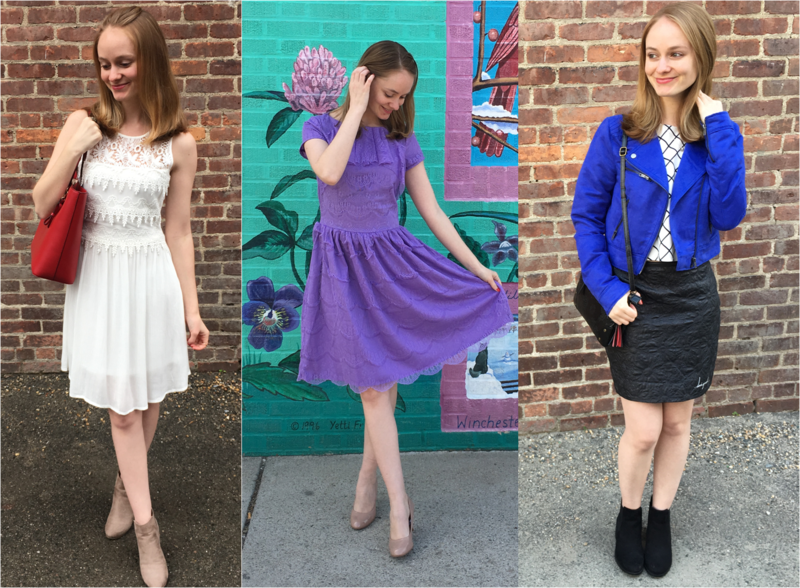 I’ve been making sure to take advantage of those choice warmer days this month with spring dresses and skirts! From left to right, we have the Tiers of Joy white lace dress by UOI Online, to the Shabby Apple lavender scalloped dress, and the ultra-chic checkered top by Minan Wong. All of these pieces really represent my femme style, while being trendy and unique. Shop similar styles at the bottom of this post! I really lucked out on dining this month! From super fresh seafood at B&G Oysters, to some of the best steak I’ve had at Boston Chops, and a delicious spring menu tasting at Seasons 52, it’s going to be hard to top that in May (but you know I’ll try)! Comment Challenge: Which of my April styles and chows were your favorite this month?